The energy markets are going to be trading in a narrow range for the near term. But you can still make money. That’s the beauty of hedging. As I noted on Monday, the initial moves will be in oil and gas, although broader hedges across energy types will become viable plays later. The strategy I’ve developed provides a way to “ratchet” profits – a positive movement of the hedged position despite the occasional move down in specific stocks – in the current energy market. I will lay out next week to several thousand people assembled for the MoneyShow at Caesar’s Palace in Las Vegas, Nev. But I think it’s only fair that you get it first. It’s all very exciting because something really significant and new has taken place. And we will be profiting from it. Today I will sketch out the basic idea I call a concentric cross-hedge. On Monday, I will also give you some stock picks for this strategy (picks that are already in the Portfolios for my subscribers of Energy Advantage and Energy Inner Circle). Bear in mind, this is not a “one size fits all” type of trade. Different developments will require different applications. The overall strategy, however, remains the same. I noted Monday that the usual idea of a hedge is to counteract risk in a portfolio by providing some insurance against movements in either direction. But this is not the only way to hedge. In a more aggressive strategy, an investor will offset (or enhance) performance in one category of stocks with selections in another. In this way, the hedge uses specifically selected shares from differing sub-segments of the sector to improve overall performance. This is a profit-intensive kind of insurance. These stocks are chosen to complement a movement in share value of the combination, not simply of each individual share. This is where the ratchet comes in. One or more of the shares could be going down and the overall performance of the hedge could still be improving. Here’s what a “conventional” hedge of this type looks like. For the volume coming out of the wellhead, the end user is a refinery. 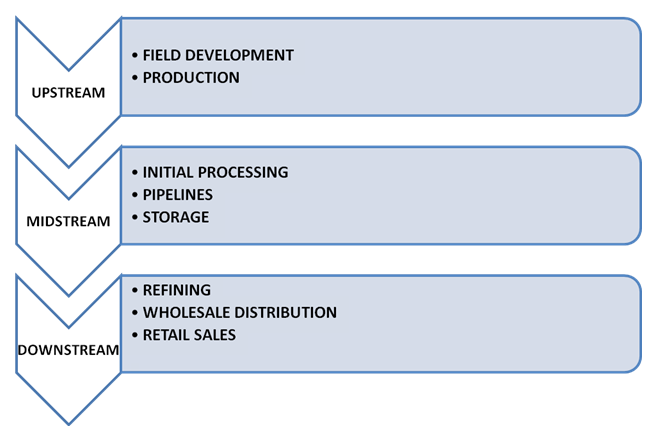 For oil products or wholesale gas, the end user is a retail or industrial customer. Each of these stages encompasses the stages preceding it. We are also retaining a traditional view of directionwith such a hedge, that is, upstream before midstream before downstream, as the following diagram illustrates. The problem with operating this way involves situations in which volatility is high – the sort of pressures, for example, like this morning’s downward move in oil prices. In this case, all of the components of this hedge are likely to be moving down as well. The solution is to emphasize the components determining value,not direction. This is what I call a concentric cross-hedge. In this case, we emphasize three components and play the relationships among them. 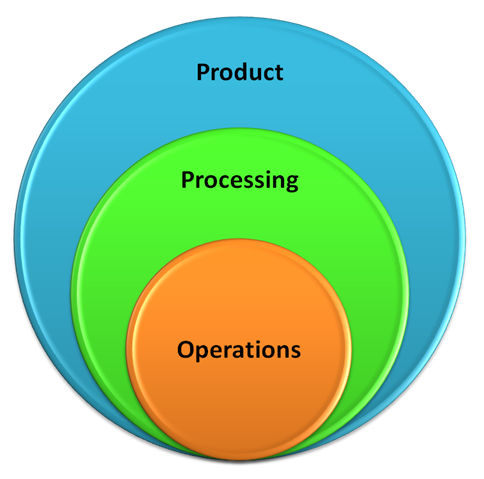 As visualized below, Productremains at the center of the hedge. However, this Product is a bit different. The key to how this kind of hedge approaches oil or gas is including within the portfolio ownership of the actual Product, not simply the acquisition of shares in a company extracting it. The other two components are also different from a conventional hedge. 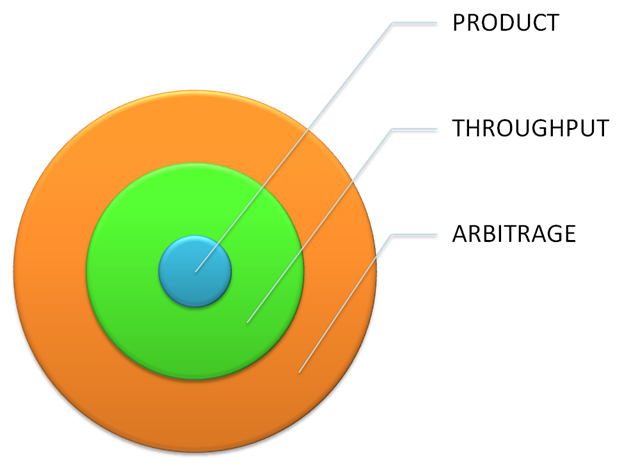 We are now looking at sub-segments in a process generating value-added components to raw material, not simply stages through which raw material chronologically passes until it is consumed. Throughput allows us to include the value generation from midstream services, those providing everything from gathering, initial processing and separation, through storage (a separate revenue-gathering add on) and transport. Arbitrage, on the other hand, is quite different. Here we are interested in identifying and exploiting that sequence (or those sequences) that allow an appreciation of price by using a differential in value opportunities. OK, this last one sounds vague. But the hedge allows us to exploit exchanging usages, regions serviced, final product type and specialized ways of delivery that result in higher prices in comparison. We are arbitraging here distinct market penetrations of the product. Here is the key to this approach: We’re improving the profitability of a combination, but it’s no longer dependent upon any particular direction, and actions no longer have to be done in a particular sequence. You can design a concentric cross-hedge in any number of ways to represent differing positive relationships developing among hundreds of market participants. Each one is structured to exploit a separate connection as a result of what the market actually does. For the more adventurous investor, it will also open up some interesting options plays. Nonetheless, each hedge structured this way will allow you to partake in profit potential resulting from a concentric move, rather than simply what is resulting from the separate selections of shares. The challenge is to do the heavy lifting in constructing these hedges, which I do for my Energy Advantage and Energy Inner Circle members to maximize a number of profit opportunities. In Monday’s OEI, I will provide an example of stock selections using the concentric cross-hedge. The hedge is possible only now because of some major developments in one component of it. I’ll fill you in on all the details and background Monday. I have recently heard there is a process that can reduce the tar sands crude to a lighter viscosity at the well site. Theoretically this could allow for cheaper transportation and reduced refining costs. This could make the tar sands much more profitable. Supposedly used in Albania now. Is there anything factual about this or is it only a good fictional story?